To extend LED bulb longevity, the circuit boards are built with high quality aluminum and the fixture itself acts as the heat sync to allow ample cooling and superior heat dissipation. The .3mm thick extrusion cut aluminum casing allows ample heat dissapation along side providing a light weight fixture protected in an armoured shell. This Contemporary Ultra Slim designed LED fixture features a series of intensive PAR LEDs to promote Marine & Freshwater growth. 1/10 the power value of standard incandescent lighting and equvilant to three T5 bulbs! All models feature a moisture resistant PC Splash Guard to protect against water mishaps. Easily removable, the splash guard can be easily cleaned to keep light output at its strongest levels. The durable high output LED bulbs are built to last 40,000+ hours. The LEDs, constructed of high end ceramic rather than the cheaper plastic LEDs competing light fixtures use, allows a higher temperature allowance while producing a stronger and more efficient light output. To add, a unique leg fixture allows this LED light to mount on various sized aquariums and sump setups. By simply removing an inner portion of the fixture's legs, the light will be able to mount nearly all aquariums it is placed upon. The Finnex RAY2 DS offers dual 7000k high powered daylight LED strips for you aquarium. This 7000k spectrum is ideal for both the health and development of users planted aquatic life. Those needing a more intense light will surely benefit by using the Finnex RAY2 DS as the intense LEDs cover a broad surface area. Incorporating more LEDs in comparison to the Finnex FugeRAY Series, users have more flexibility over which flora they choose to use in their aquascaping layouts. To extend LED bulb longevity, the circuit boards are built with high quality aluminum and the fixture itself acts as the heat sync to allow ample cooling and superior heat dissipation. The .3mm thick extrusion cut aluminum casing allows ample heat dissapation along side providing a light weight fixture protected in an armoured shell. The Finnex RAY2 DB offers a special 50/50 blend of 10000k and Actinic Blue LEDs. Produced for those with marine and reef aquariums, the Finnex RAY2 DB omits a cool blue tone throughout the aquarium with capabilities of supporting nearly all LPS and Soft corals. The 10000k LEDs provide ample light for the growth of underlying corals while the accompanying Actinic LEDs make the flourescents vibrate throughout one's aquarium. To extend LED bulb longevity, the circuit boards are built with high quality aluminum and the fixture itself acts as the heat sync to allow ample cooling and superior heat dissipation. The single cast aluminum casing allows ample heat dissapation along side providing a light weight fixture protected in an armoured shell. The Finnex RAY2 BB is a unit possessing dual strips of Actinic LEDs. 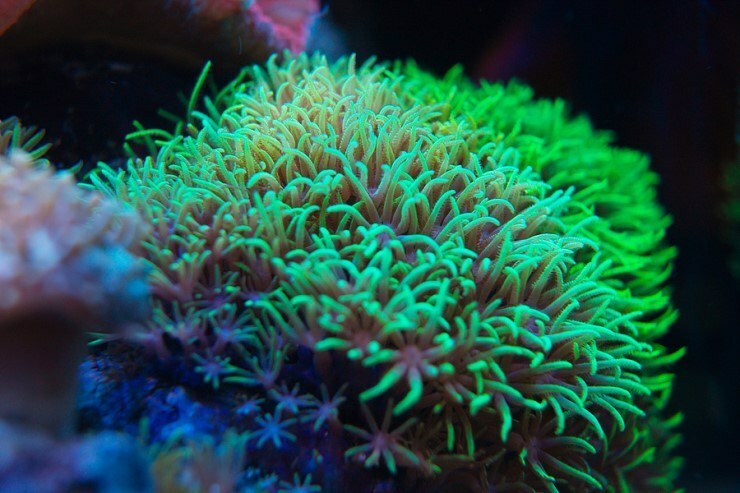 Can be used in freshwater and marine setups as an intense moonlight, or a supplemental reef light to bring out the colors in corals never seen before. The Finnex RAY2 BB is surely a must have for any aquarium that is lacking color. To extend LED bulb longevity, the circuit boards are built with high quality aluminum and the fixture itself acts as the heat sync to allow ample cooling and superior heat dissipation. The .3mm thick extrusion cut aluminum casing allows ample heat dissapation along side providing a light weight fixture protected in an armoured shell.